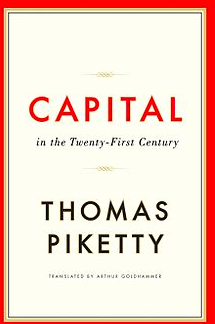 "Capital in the Twenty-first Century" by Thomas Piketty was in the news enough to get my attention. It is not the sort of a book to read when you are tired or sipping wine. It requires alertness to fully appreciate its value. I was not able to devote my best attention to it, but feel it is truly monumental. There has been some criticism, but most of it seemed very self serving by those who thought the status quo was very comfortable for them. As I finished this book I watched "Inequality for All" that had a brief reference to Thomas Piketty and reinforced the material. One of this book's advantages over other economic classics is that Piketty had access to much more information. His focus was on inequality. Piketty was able to detect patterns and of course exceptions that actually illustrate economic forces. He believes before statistics were kept that capital income (such as land rents and investments) almost always grew faster than national economic growth. The only exceptions occurred because of major events such as wars, revolutions and Depressions. At some point inequality will incite rebellion. Attitudes change, but history is too often forgotten. He uses many equations that help you understand his argument. One key one that any reader should understand simply means the rate of return on capital is greater than the rate of national growth. Very seldom has that rule not been true and by itself helps explain how the rich constantly get richer. at the expense of common workers. Slavery (i.e. treating some humans as capital) contributed a great deal of wealth to southern plantation owners. The fact that it was dehumanizing was consciously overlooked. The role of labour is too often diminished. Europe before 1914 was more unequal than the United States, but they both reduced inequality as a result of the shocks between 1914-1945 and progressive taxation. After the World War II equality actually increased, but by 1980 (when Reagan was elected) started to change to a more normal status. Inheritance is a key factor in concentrating wealth. Many start as entrepreneurs with smart thinking and hard work, but eventually they or their heirs become rentiers, i.e. using capital to generate the majority of their income. 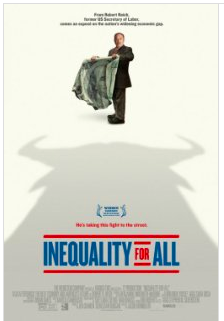 Some politicians dismiss inequality discussions as just envy. The people who deserve to enjoy the riches of life got there on merit and those others just weren't smart enough or worked hard enough. Meritocracy is an ideal, but sadly the reality leaves much to be desired. Many of us believe that theft, luck, timing all played key roles in many fortunes. And what merit justifies the next generations living lives of luxury with little contribution to society? Robert Reich in his film and many columns points out just how rich the rich are, something the masses are unaware of the extent. One of Piketty's key recommendations is a Global annual progressive tax on capital, to be sure is more an idea. Most people would not be required to pay anything and the top rate would be something like 5%. Requires a lot of global co-operation. For a few decades nations have been competing to lower their rates and individuals and companies have been taking advantage. Another contention from the author is that wealthy people should be helping to pay down the deficit by paying more taxes instead of enriching themselves by loaning money in the form of government bonds. Piketty and Reich are not against capitalism or innovation or entrepreneurship. We need incentives to encourage innovation, and hard work. Education has traditionally been the key to improving individuals as well as society, yet many rich people resent taxes going to improving schools or want to control what and how it is taught. Health care is another area where the rich begrudge the poor getting "free" care. Much infrastructure seems unnecessary unless profit can be made directly. Ironically many things that benefit most people also benefit those with more money. I believe Piketty's work deserves more consideration. Reich makes too much sense for the main stream media. Their messages are not endorsed by the 1%, but are critical to understand if civilization is to survive.